1. 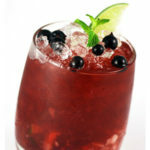 Shake tequila, Black Currant puree and lime juice with ice. 2. Strain into ice filled glass, and add apple cider.